Mainly used to manufacture composite materials, one of the most common applications for platen presses is in the forestry industry to condense wood material and forest products, producing composites like particle board and plywood. Platen presses form a vast variety of products, including rubber and plastic products such as mats and sheets. Additionally, the aircraft and aerospace industries use platen presses for airplane components like noses, nacelles, doors and seating structures. Conveyor belts, bullet-proof helmets and body armor, car bodies, ship components, some furniture, tires, stainless steel kitchen sinks, appliance parts, laminate, freeway signs, honeycomb panels and other structural components are also formed by platen presses because they are able to easily form even the toughest materials by using so much force in combination with heat. Research and testing facilities use platen presses for impact testing by crushing the test object between two platens. In plastic packaging, the vacuum molding machines that seal the plastic around the product are considered platen presses, since the plastic edges are crushed and melted between two heated metal plates. Platen presses are hydraulically powered and use extreme amounts of pressure to compact different materials together to form a new product or reduce the size of scraps. This type of hydraulic press is defined by the large, heavy, flat metal plates that crush and condense materials between them. The design of these plates features a bottom and top platen, stacked upon each other and while the bottom platen usually remains stationary, the top one moves up and down. Molded products like kitchen sinks and tires are formed by platen presses that have molds attached to the platens. Each platen weighs several tons, and is considered the heaviest and strongest component of the press. The platens are heated by oil, steam, water or electricity, and raise the temperature enough so that the material is malleable, but not molten. In order to produce a quality product, platen presses must have temperature uniformity throughout each platen, even load distribution, temperature range and platen stability under high pressure. Every component in a platen press is made of structural steel; the platens are most often stainless steel. They are often equipped with rapid cooling systems to quicken the forming process by decreasing the product’s cure and dry time. 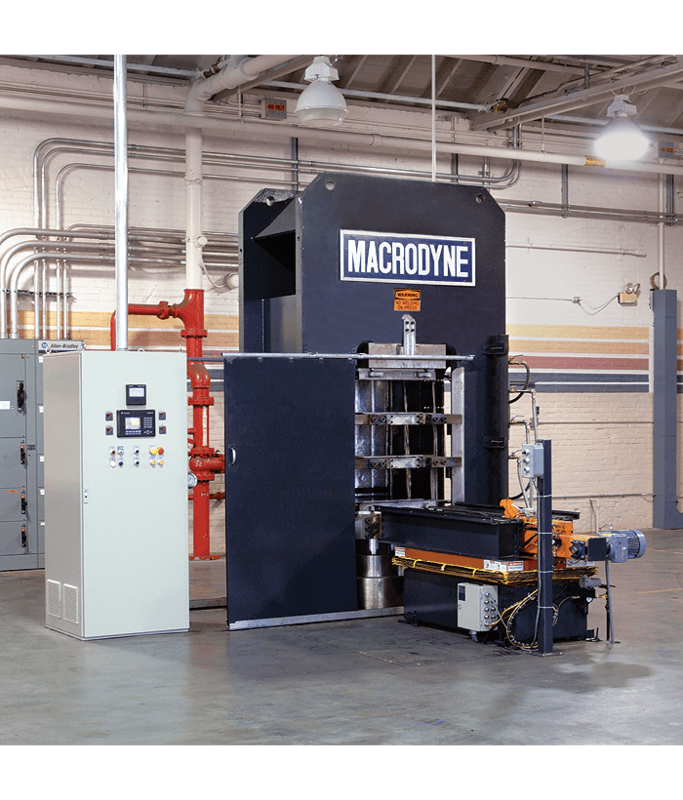 Platen Presses Platen presses are large, industrial hydraulic presses that use two large, heated steel plates to crush, condense, mold and form different products.